If you have completed you Engineering degree then this post belongs to you such as Packages Limited Lahore Civil Engineer Jobs 2016 Apply Online Latest. 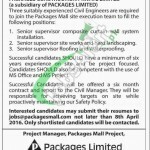 Jobs in Packages Construction Private Limited Lahore are available and it is looking to recruit Civil Engineers to join the Packages Mall site execution team to fill the following positions such as (Senior Supervisor Composite Curtain Wall System Installation, Senior Supervisor site works and hard landscaping and Senior Supervisor Roofing and Waterproofing). Candidates willing to apply should possess Bachelors in Engineering and should have a minimum of six years on site and be project focused and candidates should also be competent with the use of MS office and MS Project. Selected candidates will be offered a six month contract and duration of contract is extendable on satisfactory performance and candidates will be offered handsome salaries and other facilities as per Package’s policy. So, only suitable candidates meeting criteria should apply as per the following how to apply procedure given below. Applicants must mention clearly the position applied for in the subject line of email. Last date for submission of application is 08th April, 2016. CVs received after closing date will not be entertained for selection procedure. Candidates should bring original documents at the time of interview. For more quality jobs please visit our site JobsAlert.pk because its all about you. Last Date to Apply: 08th April, 2016. Which Party do you Support?